The Himalayas stretch 1500 miles across Asia. It is home to 14 of the tallest peaks in the world. Everest is 5.5 miles tall. Everest base camp is 3 miles above sea level. Rock samples from Everest identified grey rock (limestone) at the summit, yellow rock (marble) right below the summit, and white rock (granite) at the base. At the summit fossils from sea lilies have been identified. These specimens were 400 million years old. So how does the sea floor get to the top of the world? Ammonite (a prehistoric sea animal found at deep depths) has been found in a river at the base of Everest. So it is obvious that some immense geological force must have pushed the ocean floor to the top of the world. It all began with a single continent - Gondwana. 450 million years ago there was a single continent. Due to catastrophic geological forces, Gondwana broke apart. India broke apart about 80 million years ago and collided into Asia 55 million years ago. India was travelling fast, in geological terms, when it collided with Asia. Because of this fast collision a big mountain range was created. 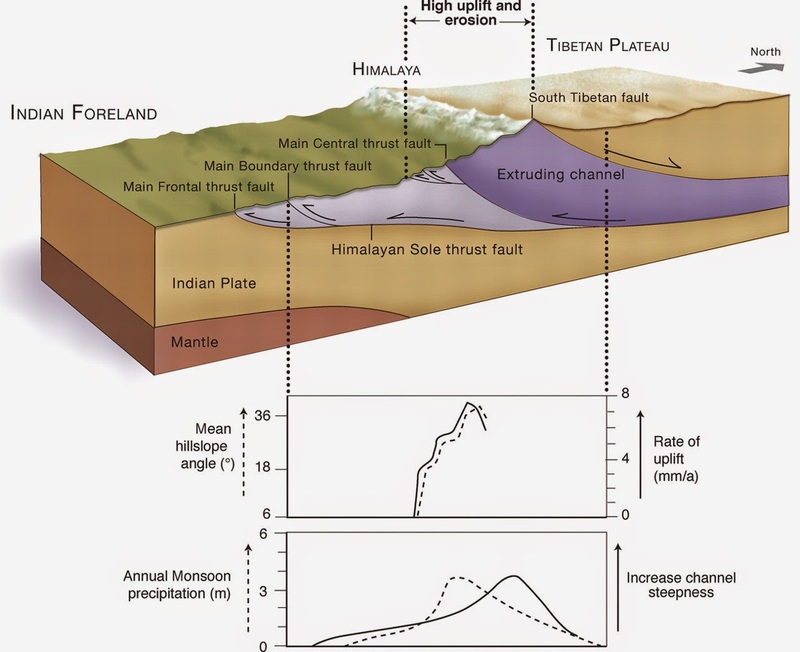 The process of Himalayan mountain range creation was complex. Huge folds of rock can be clearly seen on the Himalayan mountains. Obviously when India collided into Asia, the floor beneath folded up. The Indian plate travelled under the Asian plate. A fault was created. The rock that was pushed down became molten and then pushed back up along the fault planes. This occurred approximately 20 million years ago. The 'channel flows' created a flowing system where granite rose up. This same process accounts for why the Himalayan mountains are rising even today. GPS data has proven that even today, India is still moving at a rate of 2 inches per year - pushing northward and under Asia. A consequence of this behaviour - earthquakes. The Himalayas have seen 15 major earthquakes in the last 100 years. These earthquakes are due to a sudden release of the plates. The most recent earthquake occurred in Pakistan in 2008. Data suggest that Kathmandu may be at the centre of a future quake. There is a constant battle between the rise of Everest and its erosion. Everest is eroding at a rate of 1.1 inches per year. This is due primarily to the monsoon rains. Despite the erosion, Everest is still growing at 0.25 inches per year. One of the big benefits of such a large building are the negative greenhouse effects. Rain and the absorbed C-O2 in rain, fall on Everest due to the monsoons. This C-O2 absorbing process takes C-O2 out of the air and creates a cooling effect. During our trip we will be studying the geological finds on the trek to Everest. The above is a description of the underlying processes that we hope to see evidence of as we hike.